Making and living after a budget is one of the most basic and fundamentals tools to achieve financial success. The usual way is to look at the cash flow, deduct fixed expenses and distribute the rest. But how much should you save and what’s the consequence for the rest of the distributable funds? Saving money for investments is not only about setting yourself up for financial independence but also to provide a cash flow buffer and a cushion for any larger, unexpected expenses or changes in income. Knowing how big this monthly buffer should be depends to a large degree on how you would like to live in the future. By saving and investing you’re taking means from your present self and giving to your future self, and with the help of returns and time you’ll be handsome rewarded. To answer the question on how much you should save each month, you first have to find how much it costs for you the live the life you want to live. When you make this much from passive sources you’re financially independent. Next is to find out when you want this freedom, is it in five years? Ten years? Twenty years? Is your present living standard your goal or do you aim towards a more expensive standard of living? By knowing the size of the passive income stream and when it’s wanted we build a savings and investment model to predict The Flip, or when you instead of saving can quit your day job or boost your income. Time is our friend when building a dividend income stream which means that you don’t need to stress if you’re starting from zero, but simply realize that it’s going to take a while. How your dividends per year develops as a function of how much you save each month. If you need $50,000 per year for your chosen standard of living, it’s probably going to take somewhere from 12-20 years if you start from scratch depending on if you want to set aside $500, $1,000 or $2,000 every month. In this example we use a 3% average dividend yield, 12% dividend increase per year and a 5% turbo-boost factor from quickly appreciating stocks. This is just a simulation so actual results will vary, but it gives an idea of how the amount of new savings influence the passive income stream down the line. 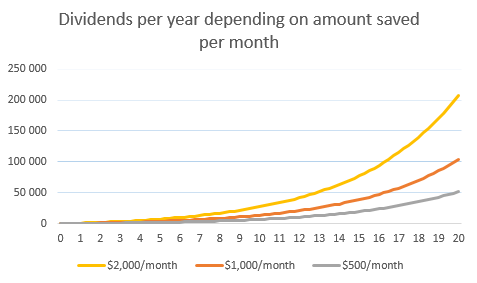 It obviously helps if you don’t have to start from scratch, $10,000 in starting capital will cut about a year from both the $500/month and $1,000/month line. But what really matters is money invested over time. As time passes the amount saved will also be small compared to the dividends re-invested, which might tempt you to cut your monthly savings. But saving is not only about setting yourself up for the future, it’s also about mitigating risk for the near future. If you have uncertainty in your employment situation, for example that your employer risks closing down, you work on a contract or you can be fired easily, you need to devote more of your salary to short- and long term saving to act as a cash flow buffer. This way you can live off your short-term buffer, freeze new long-term savings and keep your living standard while looking for a new job. So when you plan your personal budget, start by calculating how much you want to set aside for your future self. Only then do you know how much you really have available to spend on your current self.